UNITED STATES: Odd pockets of lush green – grape vines, believe it or not – stand out amid the ashen landscape left by northern California’s wildfires. It turns out vines are pretty sturdy when it comes to surviving flames, and they act as a sort of fire wall. At the Rocca winery in Napa, a patch of land called the Collinetta is intact, like other vineyards around it. Looking around from inside the vineyard, the scene is practically apocalyptic: in every direction thick choking smoke rises from rolling hills where firefighters tackle blazes that have now killed 31 people, forced thousands from their homes and destroyed more than 3,000 buildings. Helicopters buzz overhead amid a widespread sense of urgency and impending doom. But at the Collinetta, things are fine. The Cabernet Sauvignon grapes are OK, and animals on the rural estate do what they usually do: cats lounge around and doze, and sheep graze. “On the ground there is very little vegetation at this time of year” so the vines “act as a very good fire wall”, said Eric Herve, an enologist from ETS Laboratories, one of the biggest wine analysis firms in Napa. Herve lives nearby, and he and his family have been lucky: they have not been forced to evacuate. But he said “it is stressful to sleep with one eye one open and be ready to leave at a moment’s notice”. Napa is encircled by fires, said David Shew, a Cal Fire staff chief at a firefighting base camp not far from the Rocca winery. Along Highway 121 from Napa to the Sonoma, also known for its wineries, there are also many vineyards that are practically intact while non-grape fields between them are charred black. Sometimes the flames have touched vegetation at the edge of these fields before simply coming to a halt. The view from above, in helicopters, is the same. Near shops, restaurants and homes that burned to the ground, patches of vineyards are still intact albeit with some signs of damage to the leaves. Antoine Favero, a winemaker at Mazzocco Winery in Sonoma, took a tour around his land to assess the damage and said he has dodged disaster. At other wineries, he said, “most of what I saw, most destruction, are the trees, the grass, the buildings. But the vines are not that affected”. At the Paradise Ridge winery in Sonoma County, a building housing barrels and wine vats was destroyed by the fire. Some barrels remain, but there is no longer a roof over them. There is nothing left either of what used to be a reception hall and a tasting room – but again, the feisty, resilient grape vines are still there. 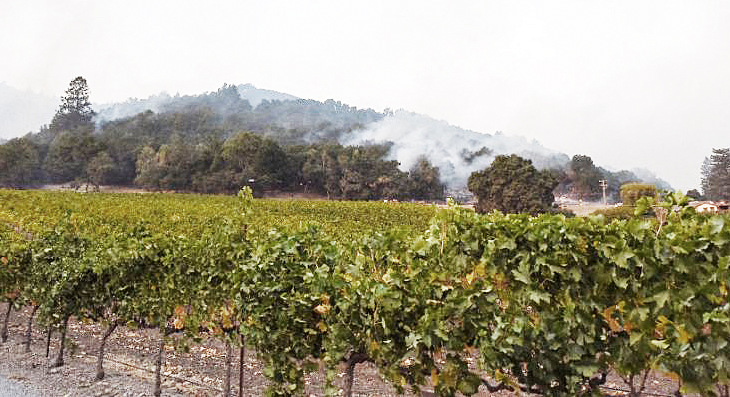 However, the smoke from the fire may still have damaged them, and the loss of vineyard buildings could be a huge blow for smaller wineries, said Herve. As the fires are still burning, it remains too early to estimate total damage to the region's vineyards, Herve added, popping a grape from one of the resilient plants into his mouth.